You might be thinking the other way: there are no such easy woodworking projects. Even the small woodworking projects are not simple and can kill your long weekend. Well, for some reason that can be true. So true if you don’t change your mind and start thinking that anything will get easier when you keep learning doing it. There are many, many good sources on the net that discuss beginner projects of woodworking. Some of them will even give you free woodworking projects and plans which you can download straight away from their website. 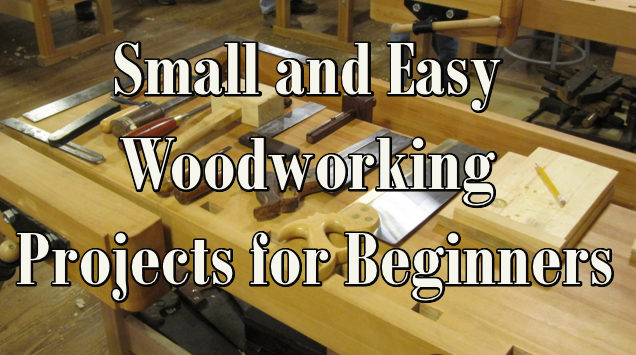 Small and easy woodworking projects for beginners are actually less difficult to complete. What we have to do is just practice. I’m still the hero of my family, having a lot of fun by becoming a DIY warrior who’s dealing with weekend woodworking projects and plans. While I’m busy, my kids play their own roles. Either screaming their creative project ideas which is unnecessary or hammering nails to finely-sanded wooden boards I’ve kept away from them. Hmm… kids! But it all ended when I found for them easy woodworking projects for kids. Now they always get busy with their own works. That’s the most important thing. Start with woodworking plans and projects that are small, simple and easy to work around. A small bench plans for your kid can be a good start. Forget about fine-crafting fancy furniture in this rookie step. Get your hands familiar first with how to handle hand tools correctly and safely before you start using heavier machine like table saw, miter saw or band saw. This might take some time but all of your practicing effort will be paid back. To broaden your knowledge, you can subscribe a woodworking magazine. This can be done both online and offline. By offline, you would likely need to pay a monthly subscription charge. If you prefer to get it online, we recommend woodworking plans by WoodMagazine.com. They provide good informational resources on woodworking that’s accurate and up-to-date. The woodworking projects are also easy to follow and beginner-friendly. Stick to the plans as instructed can give you a best result. Internet provides all we want to know about woodworking. From its basic knowledge to advanced techniques, they all are available. The information is so much so it can really make you feel overwhelmed and shift your main focus. We will share some good sites which cover easy woodworking projects for beginners as well as for those intermediate woodworkers. Their content is completely built from the ground up to ease their readers. However, they are premium so we recommend them only for those serious woodworkers or do-it-yourself warriors. If you have been online for years, you must have known TedsWoodworking.com. This site offers more than 16,000 downloadable woodworking projects and plans together with drawings, full-colored pictures, step-by-step and well-written tutorials as well as other needed information like material lists, dimensions, tools required, blueprints etc. By following their plans, you will be able to finish a woodworking project with ease and very quick. TedsWoodworking.com also hands you woodworking videos on how to build so many things from simple benches, dog house, coffee table to bridge projects. Including in their package are free DWG/CAD plan viewer, 150 premium woodworking videos, “How to Start a Woodworking Business” ebook and complete woodworking and carpentry guides. TedsWoodworking.com is really a great source for beginners to master most of woodworking techniques. Don’t worry about losing your money by buying crap. Within 60 days, they will refund your money 100% if you think their package is not for you. You should check it yourself. It is another good woodworking site offering 14,000 woodworking plans and projects. Managed by a professional woodworker, John Metz from Wisconsin, you can say that Woodworking4Home.com competes directly against TedsWoodworking.com. Even the site’s design is a bit similar. But maybe we should suggest John to put 2,000 more to equalize the number. Don’t you agree? Nevertheless, these 2 sites are now dominating the market of woodworking project and plans package for beginners. To make the competition harder (which is good for us the buyers), Woodworking4Home.com also protects your purchase with 100% money-back guarantee if you find their plans don’t work as advertised. Nothing to loose. Below are some of what John Metz have in his package. Small and easy woodworking projects and plans are easy to find. What we must do is picking carefully to ensure that we get the accurate information along with easy-to-follow guides, no matter if it is an instructional video or how-to written tutorials. More to consider if your choice is premium, is that it will still provide suitable knowledge and techniques as your woodworking skills grow from beginner to and advanced. 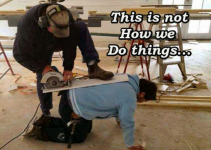 As you learn practicing – even with easy woodworking projects – put your safety first.